How to Safeguard Your Pet from Medications? As an adult, chances are you’ve thought about how the use of drugs can impact your health and the health of your family members and friends, but have you ever considered how they can affect your pets? 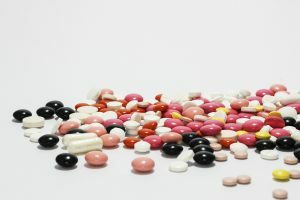 Certainly you would never cause intentional harm to your furry family member, but careless use or storage of medications can lead to serious illness or injury to your precious pet. So, what can you as a devoted pet parent do to guarantee your pet is as happy and healthy as can be, safe from the dangers of drugs? Store all prescription and over-the-counter medications in a secure space that is out of paw’s reach. The number one best way to ensure your pets can’t get access to your medications is by keeping them far out of paw’s reach. Even medication that has been prescribed specifically for your pet can cause harm to him if taken in excess. Also, consider how accessible medications are to any children in your household in an effort to avoid the possibility of a child giving your pet a “treat” that can lead to potential danger. Think before you throw away any medication. Some pets have a habit of rummaging through the trash, so think twice before you toss any unused / unwanted medication in the trach can. Flush it down the toilet, or simply ensure your trash can is kept in a secure place, such as a closed pantry or cabinet, in order to avoid any opportunity for your pet to access it. Don’t subject your pet to second-hand smoke. We all know now that second-hand smoke is deadly! If you’re a smoker, you may think your habit has no effect on your pets, but it most certainly does! Consider this ~ your pet is essentially trapped inside your home, forced to breath in the smoke you produce. And doing so can result in cancer. Secondhand smoke has been linked to lymphoma and oral cancer in cats, nasal and lung cancer in dogs, and lung cancer in birds. It is believed that cats are more susceptible to a cancer diagnosis due to their grooming habits. If you want to protect your pet from potential harm, strongly consider smoking outside only or, better yet, quit smoking all together (we know, it’s easier said than done!). Unfortunately, your pet cannot tell you how you can best protect him, so it’s up to you, as a concerned pet parent, to consider his health and well-being at all times. Death or serious injury due to a pet parent’s carelessness is avoidable, if you make the effort to educate yourself and put in place a few common sense protections. Do all you can to avoid any unnecessary visits to the veterinarian, or worse. Does Your Dogs Toys Smell? Bad breath, or halitosis, is the result of a build-up of odor-producing bacteria in your dog’s mouth, lungs, or gut. And, believe it or not, the smell from your pooch’s bad breath can remain on his chew toys. Persistent bad breath can indicate that your dog needs better dental care (dental or gum disease is a concern for dogs), or that something is wrong in his gastrointestinal tract, liver, or kidneys. In all cases, halitosis is a red flag that should be investigated by your veterinarian. If a dog has worms or an infection, his energy levels and appetite will both be too low for him to engage in play activities. A sudden lack of attention to chew toys, particularly his favorite, may be an indicator of a serious health problem. Cuts, abrasions, abscesses, and foreign objects lodged in the mouth may create infections, causing intense itching and discharge for your pooch. If that is the case, most dogs will actually chew harder on their toys to relieve the pain, leaving an odorous residue on them. If you notice your dog obsessively and more aggressively chewing on his toys, and smell an odor emanating from them, check his mouth for any noticeable injury and take him to the vet if needed. 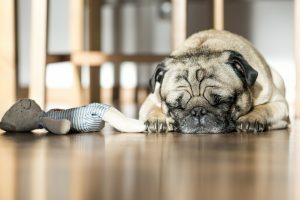 After addressing your dog’s health issues (if there are any), check his chew toys for excessive rips and tears that expose the inner material and may produce an unpleasant odor that simply can’t be washed away. As difficult as it may be for Fido to bid adieu to his favorite toy, he’ll likely forget his woes during a trip to the pet store to pick out a new favorite! 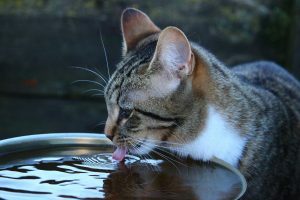 Most pet parents don’t know exactly how much water their kitty should be drinking per day, let alone how much they’re actually getting. 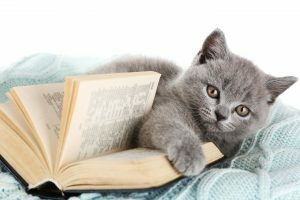 It is probably surprising to most to learn cats need anywhere between 2/3 cup and 1 1/3 cups of water per day in order to maintain optimal urinary health and overall well-being. Many cats are in a constant state of dehydration because they have a very low thirst drive and if you see a cat drinking alot, it may be due to kidney disease or some other ailment. Clean and Fresh is a Must. For goodness sake, make sure your kitty’s water bowls are clean and contain fresh water. A good rule of thumb is to change the water in your cat’s bowl each time you feed her. Also, swap out the bowl for a clean one every few days. Slimy, gross, stale water or bowls will definitely NOT entice your kitty to drink the amount of water she needs. Wet Food is a Plus. It is highly recommended you feed your cat a mostly canned food diet, as this is a super duper easy way to get more moisture in your cat’s life. Most canned varieties of cat food contain 70 – 80% water, making it an ideal source of H2O for Fluffy. If your cat isn’t crazy about canned food (which typically isn’t the case! ), try adding some water to her dry food. Ice cold water is yummy for most cats…and fun, too! Shake things up by tossing a cube of ice in your cat’s water bowl. You may even try adding a cube to kitty’s food. It’s fun for her to lick and provides her with a little extra moisture in the process. Provide Plenty of Water Sources. Consider this…would you like to trek all the way downstairs to the kitchen each and every time you wanted a drink of water? Make it easy on kitty! Place water bowls or cups of water throughout the house so she can get some water whenever, and wherever, she’s thirsty. Always keep the auxiliary watering holes fresh and clean, and located in spots that are commonly visited by kitty. Running Water is a Special Treat. You know, sometimes things can get boring for a cat. One way to spice up your kitty’s life is with running water! If your cat likes to drink out of the faucet, let her! Turn that sucker on a few times a day and let your kitty have a little fun. Not keen on the idea of leaving water running? Make a small investment in a cat water fountain. They are super fun, capture kitty’s interest, and keep kitty’s water fresh. Best of all, you can buy one for less than $25. So, if you were a cat, what would entice you to drink more water? Whatever ideas come to mind, apply them to your kitty’s world! Do whatever you think will keep kitty in the 2/3 – 1 1/3 cups per day range. Does Going To The Dog Park Annoy You? Most dogs enjoy a good romp in the local dog park, relishing the opportunity to run and play with some of their favorite four-legged friends and meet new friends along the way. But, as a pet parent, trips to the dog park may not be on the top of your list of things you enjoy. And why is that? Unfortunately, some fellow pet parents make the experience more frustrating than enjoyable, which is a shame, but what’s a pet parent to do? Well, you can either stop bringing your pooch to the park all together, or you may decide to offer some education to your fellow pet parents. Here’s a little help! We all know pet parents who neglect to pick up after their pooch, leaving not only an eyesore, but the opportunity to spread disease and parasites to other dogs. How can you avoid the spread of disease, the unpleasant appearance of dog poop scattered about, and possibly make a new friend (hopefully!) at the dog park all at once? Bring extra poop bags and offer them to those who don’t clean up after their pooch leaves a pile. Hopefully the subtle hint will do the trick! Although it may seem logical to leave a gentle leader, choke chain, prong collar, or harness on a dog when inside the park, it’s a bad idea. 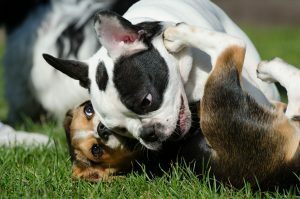 Most dogs tend to aim their playtime nibbles and nips at the neck and shoulders of other dogs and anything around a dog’s neck can lead to injury. Imagine your pooch having a good rough and tumble with his buddy the Bulldog, nipping at his neck and getting a mouthful of prong collar. Situations like this can lead to broken teeth, jaws, paws and legs, as well as potential dog fights if a panicked dog can’t detach himself from another dog’s neck. If you see a dog in the park with something around his neck, you can either attempt to keep your dog away from him, or you may opt to educate his pet parents on the possible dangers of their dog’s neck attire. The combination of small dogs and big dogs in one park is an invitation for trouble. Unfortunately, not all dog parks have designated play areas based on size, but they definitely should. Some large dogs may view a small dog as prey; for instance, a large Retriever may see a teacup Yorkie and think, “hey, a squirrel!” The high-pitched barks and quick movements of a nervous small dog may be all it takes to switch a Retriever’s calm demeanor to prey mode. If your local dog park does not have separate play areas for dogs based on size, it’s advisable that you find an alternative park for your own pet’s safety. You may even consider contacting the park’s management to request separate areas. As pet parents, it is our responsibility to monitor our canine companions. Taking your dog to the dog park is the equivalent of taking your child to a playground. Would you place your child on the swing and turn your back to chat with other parents? No! So why would a pet parent do this with their dog? Sadly, too many pet parents see a dog park as a place to let their pooch loose, sit down on a park bench, and initiate a friendly chat with a fellow pet parent while their dog runs wild. Always keep a watchful eye over your dog, because – chances are – there’s several others around you who are not keeping an eye on theirs. Sure, we all have our own pet peeves when it comes to certain things, including visiting a dog park. But should we allow these peeves to deprive our beloved canine buddy from an enjoyable, active, social outing in the park? If any of your peeves equate to safety concerns for your pet, then the answer is yes. But, if you feel you can make a difference by sharing those concerns with others, and are comfortable approaching your fellow pet parents, perhaps some friendly conversation and education will do the trick! Newsletter Creator, Darlene Wagner for Professional Pet Sitting Etc.